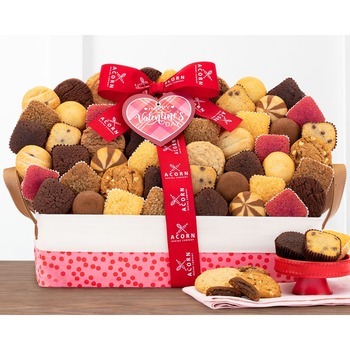 This Acorn Baking Company gift is filled with a decadent assortment of cookies and brownies including chocolate chip, fudge nut, oatmeal cinnamon raisin, sugar, double chocolate, peanut butter, almond tea cookies, chocolate and candy coated Oreo cookies and Bavarian pretzels. Order online now or place your order by phone at (800) 266-0452 (outside the U.S. (225) 927-1062). Next Day, 2nd Day and 3rd Day shipping is available starting at $11.95 ? when ordering online. An additional $3.95 will be added to all orders placed by phone. This item is shipped to the Continental US. Orders must be submitted by 3PM ET to be shipped the same day. This item is delivered Next Day, 2nd Day, or 3rd Day. Next Day means delivery will occur 1 business day after your item is shipped. 3rd Day means delivery will occur 3 business days after your item is shipped. Due to the perishable nature of this product, these are the available delivery methods, regardless of how far in advance you place your order. * I'm very satisfied and I will always purchase through 1st in Flowers! * Great experience. Huge selection, prompt service. I'll do business with them again. 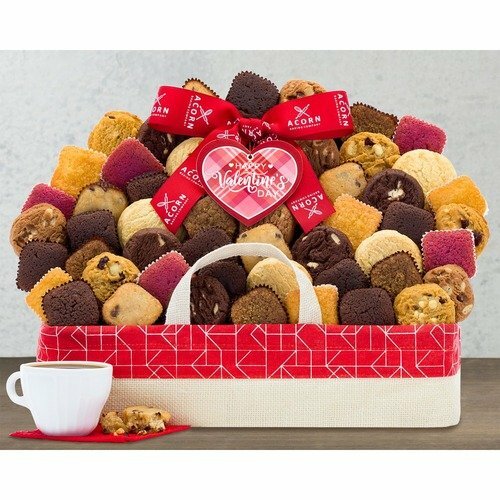 * Having a firm which can deliver such a variety of gifts in mainland U.S.A. is very convenient for me as I have family there and like to remember birthdays and Xmas and this site is cost effective for me.